Firefighters or firemen are people whose job is to put out fires and rescue people. In a city, the building they work in is called a fire station, or fire hall. Firefighters work for the fire department. There are firefighters in cities and towns who fight fires in houses and other buildings. These are called structural firefighters. There are also firefighters who fight wildfires away from towns. In some places, they are also taught first aid and given medical training so they can help people in other ways. A paramedic or an emergency medical technician (EMT) are names for people who have first aid training and usually work on ambulances. Paramedics and EMTs in many places work for fire departments. Some work for other agencies such as ambulance companies or hospitals to ride on ambulances to transport sick and injured people. Fire engines sometimes go to medical emergencies if they are closer and can give first aid before the ambulance gets there. A fire truck usually carries the same equipment as an ambulance does. Search and rescue is also done by many fire departments. Firefighters have vehicles they drive fires and rescue operations. If the vehicle pumps water it is called an engine. If it does not pump water it is called a truck. A rescue truck's main job is to responds to car wrecks, collapsed buildings, search and rescue, stuck elevators and other emergencies. If it carries the fire chief to fires, it is a fire chief car. Fire engines pump water and foam which is used to put out the fire. 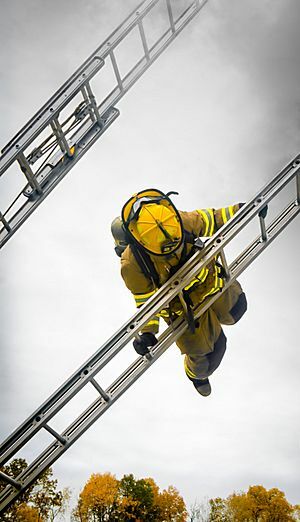 Fire trucks carry ladders and tools to help rescue people from burning buildings. Most engines carry first aid kits to help people who are injured or hurt. 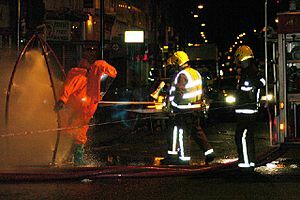 Firefighters must wear heavy clothing which protects them from the heat when they are fighting a fire. This is called bunker gear or turnout gear. As such, the skills required for safe operations are regularly practiced during training evaluations throughout a firefighter's career. In the United States, the preeminent fire training and standards organization is the National Fire Protection Association (NFPA). Often initial firefighting skills are taught during a local, regional, or state approved fire academy. Depending on the requirements of a department, additional skills and certifications such as technical rescue and pre-hospital medicine may also be taught at this time. 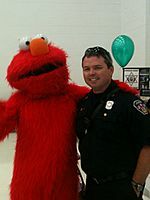 Firefighters work closely with other emergency response agencies, most particularly the police and emergency medical service, and their role may overlap with both. Fire investigators or fire marshals usually work for a fire department to investigate the cause of a fire. If the fire was caused by arson or negligence, this means that their work will overlap with law enforcement. 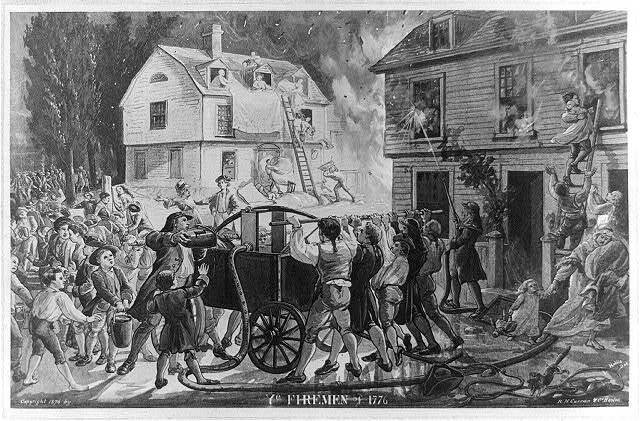 In fact, some fire marshals in the United States have powers of arrest. Firefighters also frequently provide some degree of emergency medical service, in addition to working with full-time paramedics. The basic tasks of firefighters include: firefighting, fire prevention, rescue, basic first aid and investigations. Firefighting is further broken down into skills which include size-up, extinguishing, ventilation, salvage and overhaul. Wildland firefighting includes size-up, containment, extinguishment, and mop up. 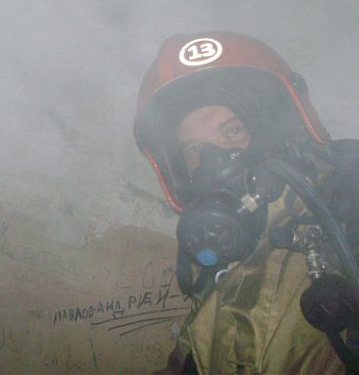 Search and Rescue, which has already been mentioned, is performed early in any fire scenario and many times is in unison with extinguishing and ventilation. A fire burns due to the presence of three elements, often referred to as being the fire triangle. These are: fuel, oxygen and heat. The aim of firefighting is to deprive the fire of at least one of these elements. Sometimes this is referred to as a fire tetrahedron if a fourth element is added: a chemical chain reaction that can sustain or re-kindle a fire. Firefighters are equipped with a wide variety of equipment to accomplish this task. Some of their tools include ladder trucks, pumper trucks, tanker trucks, fire hose, and fire extinguishers. Very frequent training and refresher training is required. 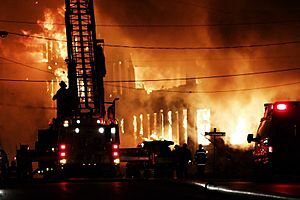 While sometimes fires can be limited to small areas of a structure, wider collateral damage due to smoke, water, and burning embers is common. Utility shutoff (such as gas and electricity) is typically an early priority of arriving fire crews. Furthermore, fire prevention can take on a special meaning for property where hazardous materials are being used or stored. Structure fires may be attacked, generally, either by "interior" or "exterior" resources, or both. Interior crews, using the "two in, two out" rule, may advance hose lines inside the building, find the fire and cool it with water. Exterior crews may direct water into windows or other openings, or against other nearby fuels exposed to the initial fire. Hose streams directed into the interior through exterior wall aperturtes may conflict with and jeopardize interior fire attack crews. A proper command structure will plan and coordinate the various teams and equipment to safely execute each tactic. Buildings that are made of flammable materials such as wood are different from so called "fire-resistant" buildings such as concrete high-rises. Generally, a "fire-resistant" building is designed to limit fire to a small area or floor. Other floors can be safe simply by preventing smoke inhalation and damage. All buildings suspected of being on fire must be evacuated, regardless of fire rating. Some fire fighting tactics may appear to be destructive, but often serve specific needs. For example, during "ventilation" firefighters are often forced to open holes in the roof or floors of a structure (called "vertical ventilation") or open windows or walls (called "horizontal ventilation") to remove smoke and heated gases from the interior of the structure. Such ventilation methods are also used to improve interior visibility facilitating locating victims more quickly. This also helps to preserve the life of trapped or unconscious individuals as it vents the poisonous gases from inside of the structure. Vertical ventilation is absolutely vital to firefighter safety in the event of a flashover or backdraft scenario. Releasing the flammable gasses through the roof often eliminates the possibility of a backdraft and by the removal of heat the possibility of a flashover is reduced significantly. Flashovers, due to their intense heat (900–1200° Fahrenheit) and explosive temperaments are almost always fatal to firefighter personnel. Precautionary methods, such as smashing a window, often reveal backdraft situations before the firefighter enters the structure and is met with the circumstance head-on. Firefighter safety is the number one priority. Whenever possible, movable property is moved into the middle of a room and covered with a heavy cloth tarp (a "salvage cover"). Other steps may be taken to divert or remove fire flow runoff (thus salvaging property by avoiding unnecessary damage), retrieving/protecting valuables found during suppression or overhaul, and boarding windows, roofs. Fire departments frequently provide advice to the public on how to prevent fires. 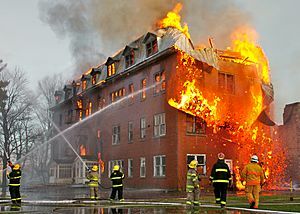 Many will directly inspect buildings to ensure they are up to the current building fire codes, which are enforced so that a building can sufficiently resist fire spread, potential hazards are located, and to ensure that occupants can be safely evacuated, commensurate with the risks involved. Fire suppression systems have a proven record for controlling and extinguishing unwanted fires. Many fire officials recommend that every building, including residences, have fire sprinkler systems. Correctly working sprinklers in a residence greatly reduce the risk of death from a fire. With the small rooms typical of a residence, one or two sprinklers can cover most rooms. The emergencies firefighters respond to are rarely limited to fires. Firefighters rescue people (and animals) from dangerous situations such as transport accidents, structural collapses, floods, terrorist incidents, spillages of dangerous substances and many others. Many fire departments, including most in the United Kingdom, refer to themselves as a fire and rescue service for this reason. As building fires have been in decline for many years in developed countries such as the United States, rescues other than fires make up an increasing proportion of their firefighters' work. Firefighters in the United States are frequently the first responders to HAZMAT incidents. The Occupational Safety and Health Administration standard 1910.120 defines four standards of training First responder awareness level, First responder operations level, Hazardous materials technician, and Hazardous materials specialist. EMS-based paramedics are typically trained to the awareness level, whereas career and volunteer firefighters are often trained to the operations level or better. Other nations have trained only elite firefighters and rescuers to do HAZMAT so that funding and equipment could go to fewer stations. This gives departments elite HAZMAT personnel and high-grade equipment for an incident. Departments place these companies in stations where they can be very mobile. A Montreal Fire Operations Chief talking to the media at the scene of a crane collapse. Firefighter Facts for Kids. Kiddle Encyclopedia.